I had a topic (drafted) in mind for today’s post. But sometimes life gets in the way. I’d been ignoring some ear pain all week until I woke with a swollen face on the same side yesterday. The symptoms were the same as the last time I had a dental abscess so I called my dentist for a same-day appointment. Sure enough that was the diagnosis and my dentist did emergency palliative care while also drilling through a three year old crown. I left with antibiotics and pain medication. Due to the location the root canal is being done by an endodontist this afternoon. Then in a couple of weeks I’ll be back at my regular dentist to start the process for a new crown. Although I’m fortunate to have dental insurance the new crown would normally not be covered. Insurers don’t cover crowns on the same tooth within five years even though there was a very good reason for having to replace it. That particular crown was originally paid for by a different insurer than the current company so that’s not a problem. My out of pocket expenses will be close to $600 when you add up co-pays for all the treatments. That’s what emergency funds are for, right? I’ll be back with regularly scheduled programming next week. For now, it’s time to take another dose of that pain medication. I recently had a crown put on and I can tell you dental insurance is a life saver. That would have put a big dent in my savings if I didn’t have it. Best of luck to you and here’s hoping you don’t have any videos of you put up on youtube from the endodontist. What’s the story behind that last sentence? I ended up not having the root canal treatment Friday as he couldn’t get it all done in one day and I didn’t want to have two sessions. It’s happening tomorrow so just had to make it through the weekend. This sounds horrible! I had an awful experience with my dentist once when he pulled a wisdom tooth our and with that made a hole right into my sinus. It was a nightmare I don’t want to remember. I wish you all the best! Aloysa, my dentist sent me to the specialist because the roots are so close to a sinus. I think it will be fine; just want to get it over with! Ouch! I’m so sorry to hear that. Feel better soon! P.S. I love the photo. Those teeth are adorable. Ow!!!! I’m getting a crown next week and one more in December. Thank god for dental insurance. Hope the procedure with the endodontist goes well. I had one of those nasty things some years ago and it wasn’t fun. My dental insurance has an annual limit of $1500 in benefits. The endodontic treatment alone will be $1000 of the limit so I’ll pay more than my normal share of the crown. But, this is $1500 that isn’t directly coming from my pocket so I appreciate it. I feel your pain. Shortly after we moved to Anchorage in 1984, I woke up on a Saturday morning with the same kinds of symptoms — and we hadn’t gottten a dentist yet. My jaw was swollen grotesquely and boy, did it hurt. This was the pre-Internet era, mind you, but luckily the state dental association had an answering service that routed me to the dentist who was on call that weekend. He wound up being our family’s regular dentist for the next 17 years, until we moved. Once he gave me the novocain I was the happiest person in the world. I lay in that chair for several hours while he worked on me but you know what? I didn’t care! It didn’t hurt any more! I hope your medicine is working and that this will soon be only a slightly icky memory. How wonderful that the referral turned out so well. I found my dentist by asking a coworker 10 years ago. We realized how good he is when I switched to a dental HMO a few years ago and both my husband and i had awful experiences with the new dentist. Needless to say I switched back at the first opportunity. P.S. I can see how people get addicted to Vicodin; I’ve been a happy girl all weekend! I had a buddy that had an abscess tooth, he said it was very painful, so I feel for you! I need to get two crowns, but they are so expensive! Yes, crowns are expensive but the alternative may be not to have that tooth. One of my goals is to go to my grave with my original choppers. Of course, they’ll be worth their weight in gold by the time all the costs are added up! Awe..! I hope you feel better soon! Young and Thrifty, thanks for the comment regarding the photos. I use the photodropper plugin and it works really well. Man, I know that’s tough! My wife and I both had root canals done within a month or two of each other. Like you we have insurance, but the out of pocket costs were still a shock to us! Glad you have emergency funds to tap into! Khaleef, that must have hurt the budget! I’ll have to spend a few months rebuilding my emergency fund so I’m keeping my fingers crossed that there aren’t any more in the near future! Oh that is terrible Kay Lynn! I hope you are feeling better really soon. 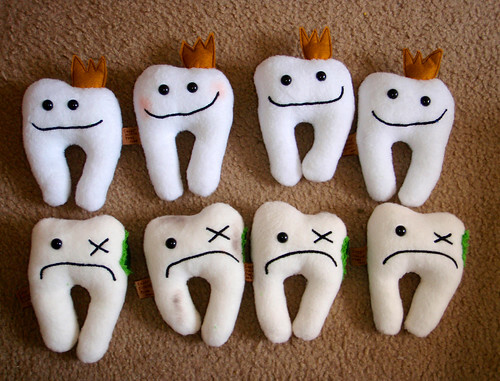 The little stuffed teeth in the picture are really cute at least. Get some rest!! OUCH! I have had 2 root canals and JEBUS they hurt. Feel better. Thanks, Evan. It was not fun, but the painful part is over. At least physical pain. There will be financial pain when I pay for the crown! Ouch .. that sounds so painful. Hope you’re feeling better. Mandy, thanks for your good thoughts. My tooth (mouth) i feeling much better. It’s nice that changing insurers worked for both of us!